Salzburg was hot in mid July, very, very hot and humid. 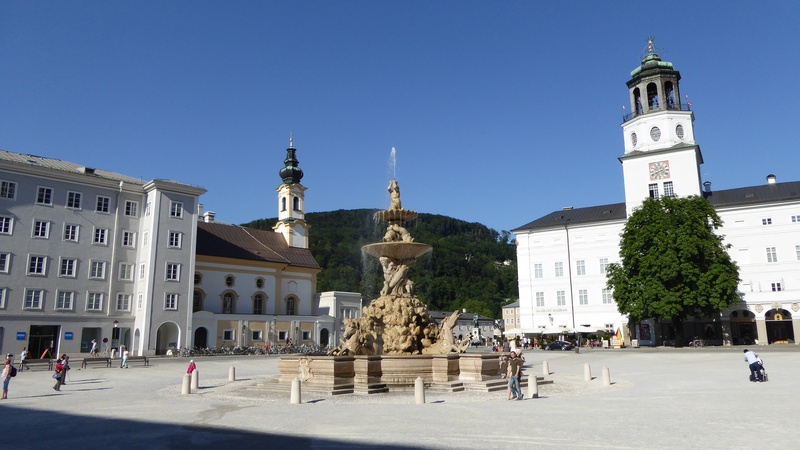 It was also crowded, very crowded with tourists who had arrived in town for the annual Salzburg Music Festival and to see the newly opened Dom Quarter Museums and former Residence of some of the Salzburg ruling Prince Archbishops. And, it was school holidays. Not the best time to be in Salzburg! I had not been to this celebrated baroque city since 1969 when we were able to wander in peace and to imagine how it must have been in Mozart’s time. This time, that was just not possible. 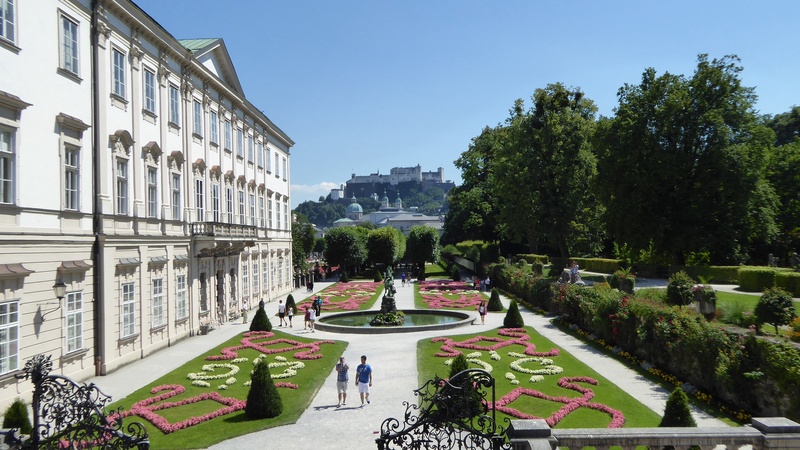 Perhaps the best time to visit Salzburg, the famed Baroque city, the Rome of the North, is in the spring or autumn. Then it may still be possible to wander quietly and not have to jostle your way around the streets which are indeed filled with beautiful buildings, all looking well maintained. We bought a two day Salzburg Card so that we wouldn’t have to line up at ticket offices but even that is not much help when every venue is so full of people. I chose our hotel close to the Mirabell Palace and Gardens which I had long wanted to visit. From there, I thought,we could walk everywhere and that would be good. I didn’t count on the hot weather! We found the pavements were so hot that, after some walking, our feet ‘burned’ in our shoes. And even when we arrived ‘home’ from our exploring in the evning there was no relief from the heat. Our hotel purported to be four star, but there was no air con., not even a fan, and only one opening window. In general, Salzburg hotels provide for the need for warmth in the winter not for cooling in the summer. With heat well over 30 degrees until late into the evening and not a breath of air all night, it was not at all pleasant. It was all a bit of shock to us after the cool evening breezes at our previous stay beside the lake at St Wolfgang. On our first day in Salzburg, we walked to the Mirabell Schloss, a Palace built in 1606 by Prince-Archbishop Wolf Deitrich to celebrate his love for his mistress Salome Alt. With Salome, Wolf Deitrich had had fifteen children, ten of whom survived. He named the Schloss, Altenau, but it was renamed Mirabell by the next Prince-Archbishop, Markus Sitticus who had had Wolf Deitrich imprisoned in the Hohenslazburg Fort. Like almost every visitor to this palace, we climbed the outside steps to a position on a small hill beside the Palace. 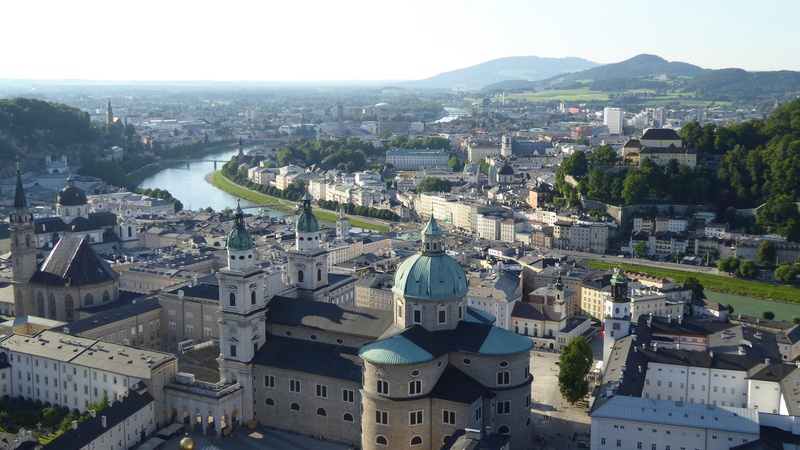 From there we looked into the distance across the formal Mirabell Gardens to the dome of Salzburg Cathedral, the Dom, and on up towards the Hohensalzburg Fortress on its perch high above the city. To get there was our goal for the afternoon. .
What I particularly wanted to see in this palace, was its magnificent baroque Marble Hall, the ballroom. During the years 1721 to 1727, the then Prince-Archbishop, Franz Anton von Harrach, employed the the famous baroque architect, Lukas von Hildebrandt, to redesign the palace. He was resposible for the stunning beauty of the ballroom. In this room, a young Mozart and his sister, Nannerl, once played for the aristocracy. Concerts are still held in this hall. The Marble Hall and the massive marble staircase in the palace, were fortunately untouched by a fire which swept through the city of Salzburg on April 30th, 1818. 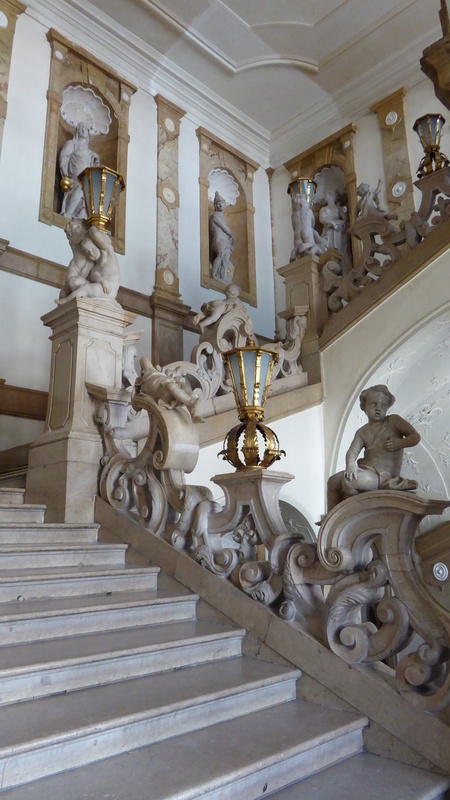 Although we were able to climb that staircase and see the many cherubs balancing on the balustrade and view the beautiful sculptures by Georg Raphael Donner that adorn all the large niches, we did did not see the ballroom. It was closed to visitors that day because of a continuous stream of Saturday afternoon weddings. It’s apparently a very popular place for civil weddings… and why not? . Modern altar and stain glass windows of St Andras Kirche on Mirabellaplatz, Salztburg. Just across the road from Mirabell Gardens is St Andräs Church. It’s not one of Salzburg’s famed baroque churches. It’s newer, being built in the 1890s. The simplicity of its interior without any elaborate detail and the modern style of art works was a refreshing change. 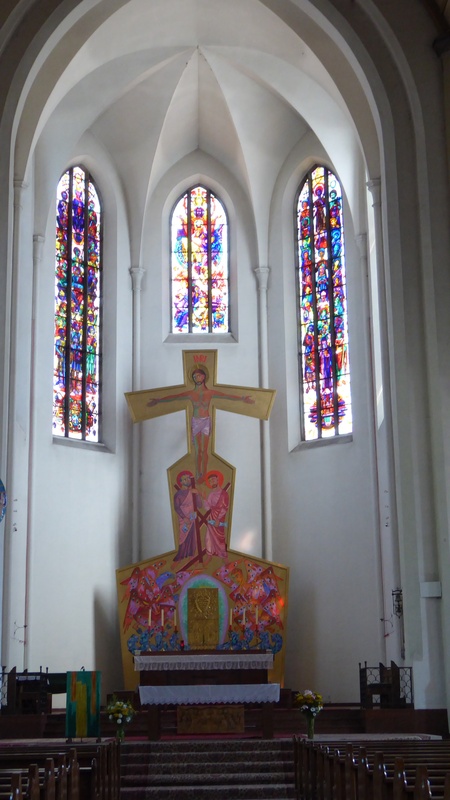 IHere the church is dominated by a stylised altar, art work by Karl Weiser, and three figurative glass windows. I’ve always been fascinated by the development of pictorial glass windows through the centuries. These three windows represent St Mary and the saints, each figure represented being named on an interpretive board in the side aisle of the church. As well as being fascinated by the variety of religious art through the ages, we found on this particular day that churches indeed also offered the coolest place for respite from the heat. We hoped to return here for an evening organ concert. On Thursday mornings the large square in front of this church changes from being a car park at a main bus/tram stop to being a colourful farmer’s market…. a pity we weren’t there on a Thursday. Next time perhaps! . The church of the Holy Trinity, Salzburg. Still on the right bank of the river, on our way to the old town and Dom Quarter, we popped into the Holy Trinity Church, the Dreifaltigkeitskirche. It’s part of a large seminary for the training of priests. I had thoughts of another quiet rest stop but, just inside the door, our way was barred by a grill. At least it was cool in there. 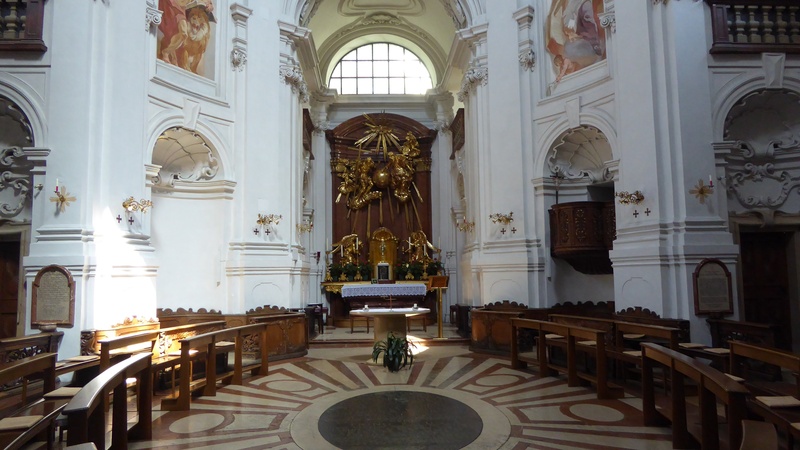 This church, although in the Baroque style, is much simpler in style that many baroque interiors in Austria and elsewhere in Europe. The floor of the church is elliptical in shape, as is the dome above. . The imposing towers of Salzburg Cathedral, the Dom. Crossing the river, we jostled with hundreds of other tourists in the narrow streets making enjoyment of the buildings an impossibility. We finally came to the large Dom Square and headed for the Dom. 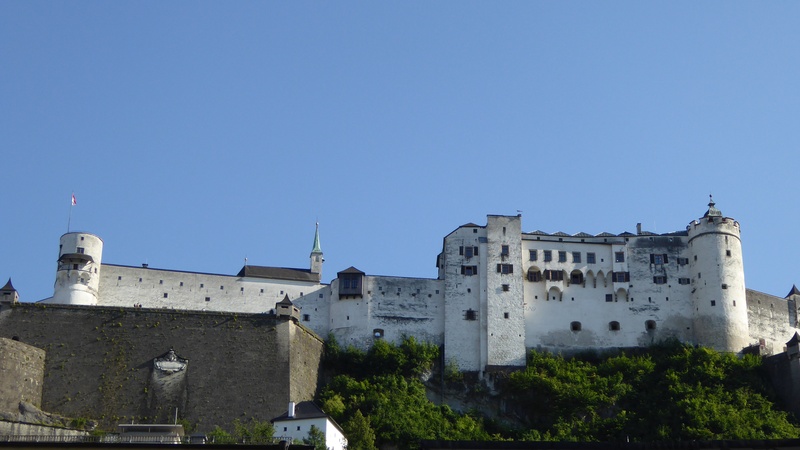 We were both looking forward to our visit there and perhaps a quiet sit in the cool as we took in the magnificence of this masterpiece of Salzburg’s buildings. That was not to be! The crowd trying to get into the church was huge. We were not aware of the fact at the time, and there were no signs to alert us to the fact, that there was a concert about to begin. We thought we would just have to wait our turn to get inside. When we got closer to the door, we realised that a concert was indeed about to begin. All tickets sold. By now we had become unwittingly caught up in the push and shove of the crowd as people pushed their way in to claim a better seat. We, of course, were not allowed past the door, so had to fight our way back out! It was a nightmare made more so by a lady pushing a wheel chair who was determined that she would run over my toes rather than let me get back out. It’s moments like that a really good knowledge of the language would have been helpful. We decided to retreat to a small restaurant for a meal. We had not had lunch so something to eat was in order plus we needed a break from the heat and crowds. It would have been nice to sit in one of the shaded small streets where the sun never gets a chance to enter. But the street side cafés were, as usual in Austria, full of smokers. We finally found a small air conditioned place where we were able to enjoy a delicious salad and cold water. It was great to have a rest in a quiet spot that, for once on this hot day, was not in a church. . The main Dom Square, Salzburg. After that we headed back to the main Dom Square but the heat coming off the vast area of white pebbles was relentless, so we needed to have a plan B. . 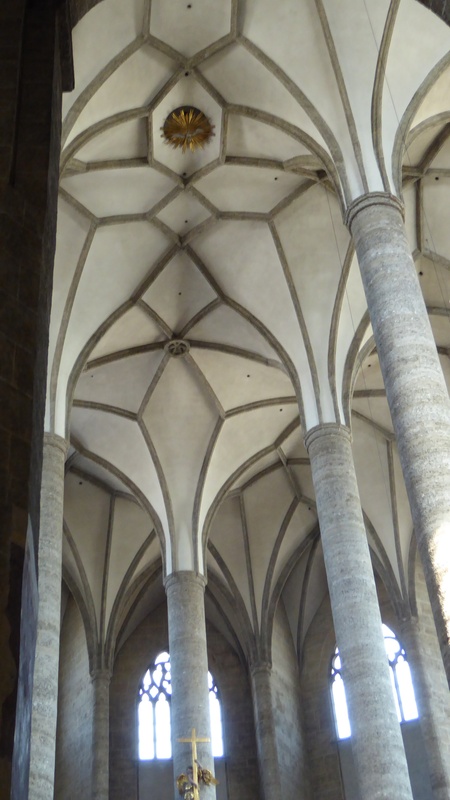 The soaring stone pillars of the Franciscan Church, Salzburg. Well, there was another church nearby. There seemed to be churches everywhere. This one was the Franciscan Church and although it was busy with tourists, at least it was cool in there. This church, like the more famous baroque Dom, has its origins right back in Salzburg’s early Christian period. 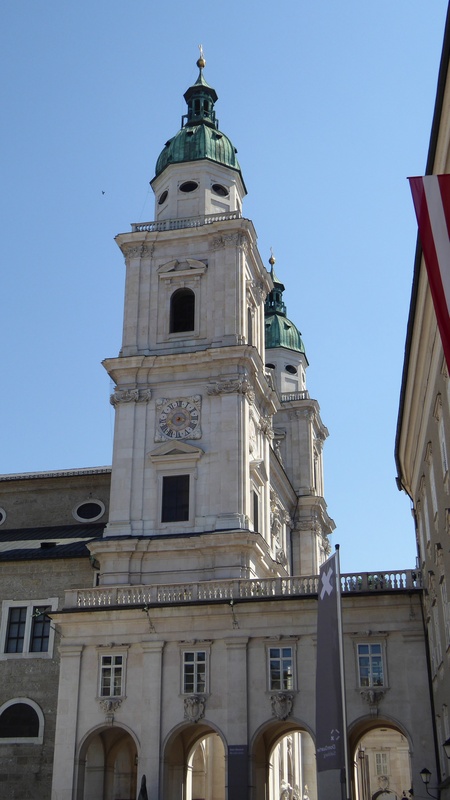 But whilst the Dom was a bishop’s church, and thus of the aristocracy, the Franciscan church was built as a church of the people, by aspiring Salzburg burghers and business men. The early church was constantly being destroyed by fire. But the current Gothic style church, dating back to the 1400s, was constructed of solid stone with soaring pillars and an air of elegance. It’s meant to be a place of quiet meditation…. That is, it should be, except for the babble of tourists. . The Hohensalsburg Fortress high on a rocky crag above the city. Perhaps, we thought, it might be a little cooler up on the hill where the old fort was built. Our Saltzburg Card included a ride up there on the funicular and entrance fees to the fort. So to the Fort we went. And that was a very good idea. At least there was a zephyr of a breeze up there. .
An image of the fort in 1653, almost as it is today. And inside the very thick old stone walls of the fort there were some cool, quiet spots with seats to rest and take in this massive old fortress. The fort was begun in 900 and has been added to over the centuries until the late 1600s. 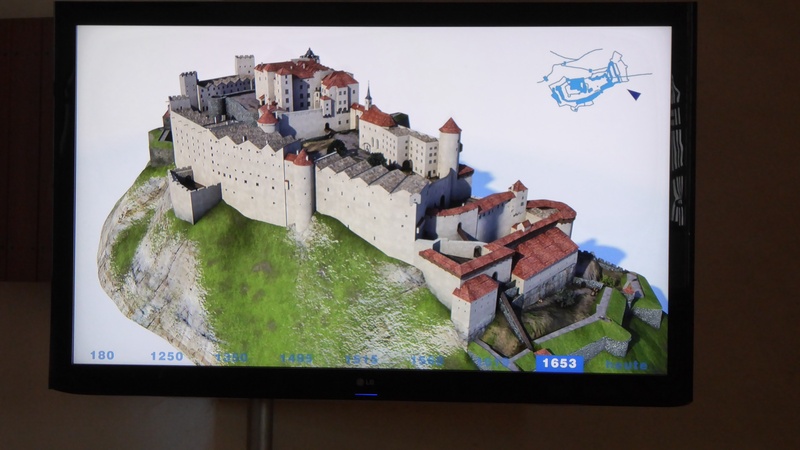 In one area there was a video display of computer generated images of the way the fort had grown over the years. It had begun with just a small square building and grew to meet the needs of the town’s defences. I took photos of a few of the images. I was fascinated by the archeology and the way the story of the fort has been pieced together. The photo above is more or less the fort as it is today, much the same as in 1653. It is very large and contains many, many steps! David went on to climb those myriad steps and explore more of the fort while I enjoyed a quiet time under a very old tree in the main courtyard. It was a much better option for me! . The view from the Fortress down across the old city of Salzburg. Later, we went up onto the parapet that gives a wonderful view down over the city with the Dom taking centre stage. From there we could see just how far we had walked, from beyond the trees near the river in the centre distance. And we could also see how far we had to walk to get back to the hotel! It was still over 30 degrees and very humid. It was a long, hot walk back to our hotel. We did have a bit of a break in a square where a couple of men were playing street chess. We joined a few onlookers, and like them enjoyed a cold ice cream. Then, somehow, I managed the rest of that hot walk and finally fell onto the bed with huge relief. There was still no movement in the air. So as we lay there, seeking some relief from cool, wet towels, we made plans to get out of the city the next day, Sunday, when the heat threatened to be hotter and the crowds threatened to be much larger. More of that anon.